The top appeals court will decide on Aug 13 the fate of Bengali language daily Janakantha’s editor and executive editor now on dock for contempt of court. A six-strong Appellate Division bench headed by Chief Justice Surendra Kumar Sinha declared the date on Monday after hearing their response to the contempt of court rule. The bench was formed a day back by a four-member bench, after the defence counsel of Editor Atikullah Khan and Executive Editor Swadesh Roy pleaded for hearing their response to the rule in a different bench without the chief justice. On Jul 29, after the apex court gave the final war crimes verdict in Salauddin Quader Chowdhury’s case upholding death, the Supreme Court issued a contempt rule over the article published on Daily Janakantha. In his article Roy wrote, “Salauddin Quader Chowhudry is a heinous killer of 1971. He is among those traitors who bathed most in the blood of innocent Bengalis. His appeal verdict is on Jul 29. Father Mujib! Here, too, your daughter is being made to stand with her back to a crucifix. 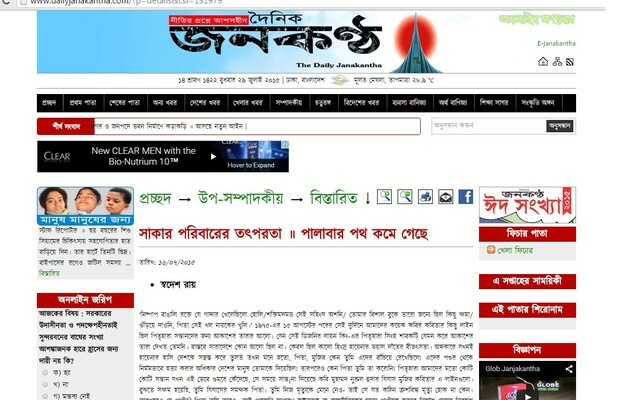 “Why is Sheikh Hasina’s government busy trying to stop some judges from going on foreign visits now?” read the article. In a verbal order, the bench also asked the attorney general to verify whether there is any substance in the claim made by Janakantha journalist about the chief justice being barred from going abroad by the Prime Minister’s Office. The court on Monday also asked the state’s chief legal officer to read out the part of Roy’s article on the issue. On Sunday, the chief justice said the law empowers him to decide entirely on his own whether or not to go abroad. Even SC judges going abroad will have to be cleared by him. “After taking over as the chief justice, I sat with a number of my predecessors, took their advice on how to carry out my responsibilities. The chief justice said he was invited by a Bangladeshi students body in London. They wanted to give him tickets for the trip which he turned down. All the communication in this regard was channeled through the Bangladesh embassy. His Personal Secretary Anisur Rahman submitted the records to the court. Attorney General Mahbubey Alam, who represented the state, said, “The report was written to confuse the people. You wrote Quader Mollah’s verdict, Sayedee’s verdicts, we are waiting for copies of the verdict in Mujahid and [Salauddin Quader] cases. The chief justice also instructed the attorney general to find out if the daily published any reports following the contempt rule which might influence the court.